You can either get normal 0.15oz in the tube or the small round container for $3. Please specify which you want else it will be chosen at random. Coconut oil is antibacterial, antimicrobial, and antifungal! Millions of dollars are spent each year on Lip Balms to treat chapped lips. Unfortunately, most lip balms just sit on the surface of the and do little more than block further loss of moisture from the lips, while doing almost nothing to help treat the underlying cause. Lip tissue is one of the thinnest tissues of the human body. Because these tissues are so thin, moisture can escape from the lips faster than other skin tissue. When we don't consume enough fluid and the body becomes slightly dehydrated. Being thin skinned, the lips are the first tissue to react to dehydration. They become dry and inflamed because inflammation is the first reaction of the skin to drying effects. Licking the lips, which is the natural reaction to dry lips, does nothing to improve the situation. In fact, licking makes the condition worse because saliva contains some digestive enzymes that can actually start to break down protein. Since all tissue is made up of fats and protein, saliva can be very irritating, and make the symptoms of pain and burning worse. 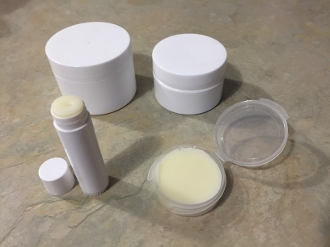 Regular Lip Balms contain oils such as Castor Oil that really do nothing except sit on the surface of the lips and help block further loss of moisture, but do nothing to relieve the irritation and inflammation What's needed is an oil that not only helps block loss of moisture, but also one that will penetrate the skin and relieve inflammation. Organic Raw Coconut Oil Is The Answer! Lip Balms made with Organic Raw Coconut Oil will do both. Raw Coconut Oil is rich in Lauric Acid and other medium chain fatty acids that can cross the skin barrier and relieve inflammation in the subcutaneous layer. The soothing effect of Raw Coconut Oil is felt almost immediately, and rapidly relieves the underlying inflammation while offering protection from further moisture loss. Treatment of chapped lips with Organic Raw Coconut Oil and increasing the intake of oral fluids, will rapidly heal your sore chapped lips! Shea butter is a natural fatty oil extracted from the nuts of the karite nut, or African shea, tree. This fragrant extract has long been used to treat skin-related ailments including eczema, sunburn, razor rash, and blemishes. As this natural product is said to be very moisturizing, it is not surprising to find that shea butter lip balm is a popular choice for treating dry, cracked, or aging lips. Additionally, shea butter is also thought to contain nutrients said to help heal skin and improve its general appearance. Although this product can be used all over the body and in the hair, many find that shea butter is a good option for improving the health of the lips. Shea butter lip balm is most commonly used to help heal and moisturize sunburned, dry, or cracking lips, as it is said to not only bear anti-inflammatory properties, but is also easily absorbed into the skin. Though it is often used to heal chapped lips, many feel that it can also help prevent dry lips, because it is said to create a moisture barrier. In addition to preventing dryness, shea butter lip balm may also be useful in protecting the delicate skin of the lips from the sun and damaging free radicals. Depending upon the processing of this oil, the amount of sun protection factor (SPF) can vary; some can reach up to an SPF six. Shea butter is also thought to be plentiful in important antioxidants such as vitamins E and A, which may help protect the lips from the free radical damage that can make them look prematurely aged, thin, or lined. As well as containing vitamins E and A, shea butter lip balm may have a number of other potentially useful nutrients. For example, this product may contain vitamin F, more commonly known as essential fatty acid, which is thought to help the skin look more supple and youthful. Another example of the beneficial nutrients in this type of lip balm is vitamin K, thought to help preserve skin elasticity. When used over time, this combination of nutrients is said to be helpful in treating and preventing lip lines and aging, relieving sore or dry lips, and healing irritation, sunburn, and small wounds. Heritage Products gives you certified Rose Petals Rosewater from European roses. This liquid skincare product delivers pure, natural essence of rose oil mixed with Vor-Mag Water (water that has been vortexed and magnetized to raise the energy to a higher vibration that many believe to be more beneficial). Experience the delicate floral scent of real roses any time of the year. Vor-Mag Water (water that has been vortexed and magnetized to raise the energy to a higher vibration that we believe to be more beneficial) and Rosa Damascena (Hydroessential Rose) Flower Oil. Recommended in the Edgar Cayce readings.